I share an office with a friend of mine who knows that I am obsessed with any and all dogs. He handed this ARC (advance reader’s copy) to me just based on the title. I had just finished reading the Fablehaven series (Brandon Mull) at work on my lunch breaks and decided to read this while I chose the next series to tackle. Cameron Weaver and his mom have moved several times to avoid Cameron’s stalking, physically abusive father. They eventually move to a ramshackle farmhouse in Wolf Hollow. Cameron finds a packet of drawings done by a child in the basement and begins to see the ghost of a boy who calls himself Jacky. 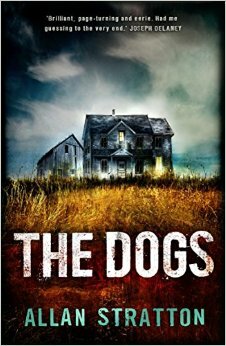 After enduring some teasing at school, Cameron does some research in the local library and learns that the wife and son who used to live in the farmhouse left town and the husband purchased a pack of guard dogs, who later killed him. But is that really the truth? Is Cameron crazy or is Jacky’s ghost trying to tell him something? And is Cameron’s dad really as dangerous as his mom makes him out to be? It’s definitely a bit of a paranormal thriller – maybe a gateway book for Stephen King? I’m a self-professed chicken and have never read King, so I can’t really say. It’s less military than Constant Fear, which I read earlier this year, although there’s the same sense of suspense. I really enjoyed this book and struggled to put it down. I felt that I just had to know what happened to Cameron and Jacky. It also had an ending that wrapped up enough loose ends without being cloyingly sweet, and the final solution kept me guessing. I switched my guess at the solution back and forth several times before the end. It was a very fast read (about 2.5 hours). Highly recommended. It comes out on September 1. Seriously, I promise it’s Sapiens. That nonfiction book is taking me forever. But I’m in the last 100 pages, so soon. I like your review style, Cathy. Very authentic :). Would love to feature your reviews in our weekly curated email digest that goes out to thousands of people. Thanks for the compliment! I’d love to contribute to the email digest – do I just sign up with ReviewCreep?